The Dolphin House at the Funky Fish House Village in Cape Harbour is a truly unique home in a truly unique neighborhood. 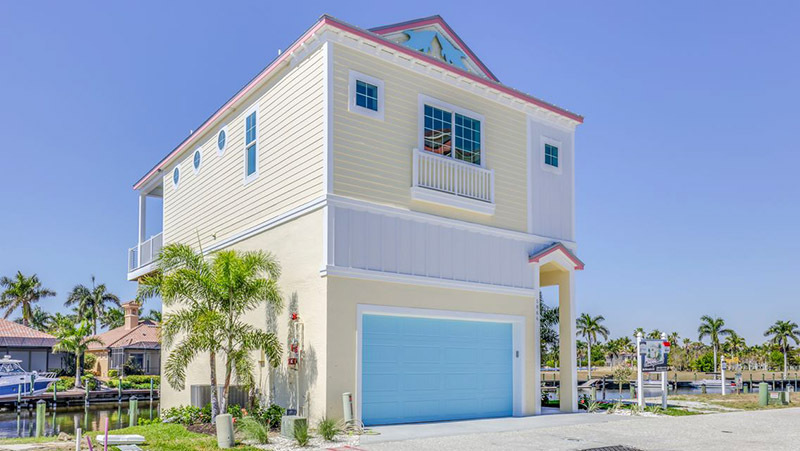 This home was designed to take full advantage of great waterfront views, with three stories on the water side and two stories on the road side. The lot is 65 feet deep, approximately 38 feet of which is land, and the remainder is water, which allows a deck to be built over the water. There are no setbacks to the water. The deck of the Dolphin House extends over the dock below, and is approximately 20 feet above the water, providing for spectacular views from the deck and the great room. The great room includes an 18 feet of sliding glass doors. The master bedroom has a balcony overlooking the dock below, and a porthole shaped window in the master shower. At dock level is an all-purpose room approximately 24'x14' that includes an 18 foot wide sliding glass door.